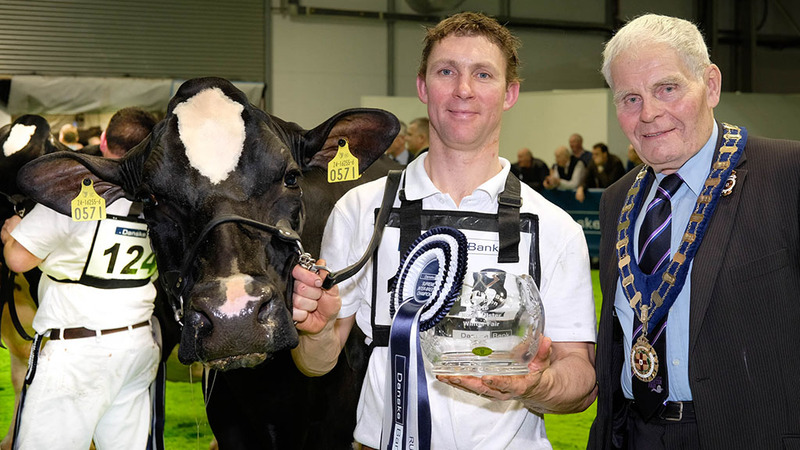 Holstein Hilltara Lauthority Echo 2 from the McCormick family stood supreme at the Royal Ulster Winter Fair. After a break of 10 years, the McCormick family, from Bangor, Co Down, took centre stage at the Royal Ulster Winter Fair with their home-bred third calver Hilltara Lauthority Echo 2, winning both the Holstein and supreme inter-breed championships. The McCormicks shot to fame two decades ago, as owners of the legendary cow Medway Supreme Maude. 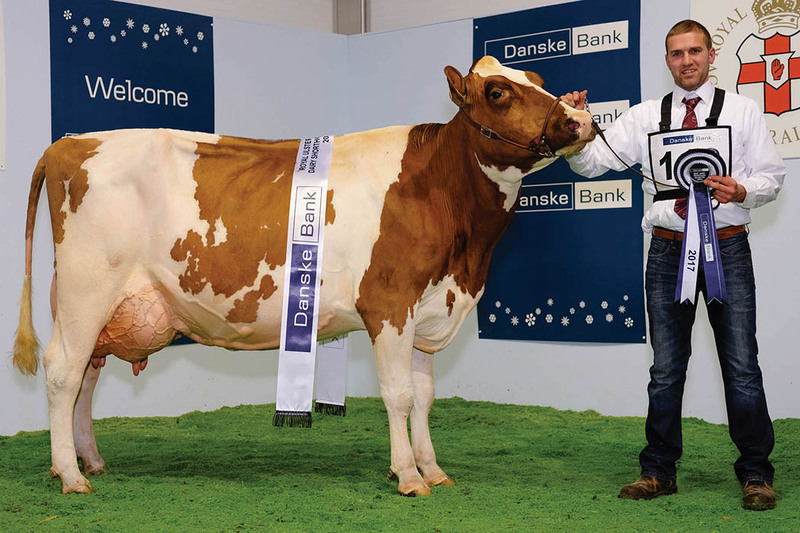 She won every senior dairy title which the island of Ireland had to offer, many on numerous occasions. And now, courtesy of Hilltara Lauthority Echo 2, it seems they have a cow which can genuinely follow in Maude’s footsteps. The McCormicks’ victory at the winter fair follows the success they notched up with the same cow at the Baileys’ cow of the year event, held as part of Virginia Show at the beginning of August. Echo is currently giving 42 litres per day. The Holstein reserve champion and reserve inter-breed champion, was Priestland 5446 Shot J Rose, bred and exhibited by the McLean family from Bushmills, Co Antrim. A Shottle daughter, the cow was extremely fresh, having calved only four weeks ago. She is currently giving 60 litres of milk per day. Rose produced 11,500 litres during her second lactation. Earlier this year she won her class at Balmoral Show and has performed extremely well at the winter fair, going back to 2015. The Jersey championship and inter-breed honourable mention went to Clandeboye Tequila Cookie, bred and exhibited by Clandeboye Estates, near Bangor, Co Down. The estate is home to 30 Jersey and 70 Holstein cows, all pedigree. Cookie was All-Britain Junior Champion in 2016. Hank van Exel, who farms on the outskirts of San Francisco, judged all of the show classes at this year’s winter fair. He was the 2015 recipient of the Dairyman of the Year award, an accolade bestowed upon him at the World Dairy Expo, held at Madison, Wisconsin. “I was tremendously impressed with the cattle taking part in all of the classes at the winter fair," he said. “My champion has tremendous dairy quality and would hold her own in any international competition class. Inter-breed Supreme, S. and J. McCormick, Hilltara Lauthority Echo 2; reserve, McLean family, Priestland 5446 Shot J Rose. Heifer Sup., Clonpaddin Holsteins, Clonpaddin Polly 2; res., Clonpaddin Holsteins, Clonpaddin MCC Chrisi. Ayrshire Sup., J. Hunter, Ardmore Janet 10; res., J. Hunter, Ardmore Orphan 117. Dairy Shorthorn Sup., N. and R. Booth, Kilsally Jill 17; res., G. and J. Booth, Beechview Empire Tiny. Jersey Sup., Clandeboye Estate, Clandeboye Tequila Cookie; res., Clonocey Holsteins, Thurlstone May Fay. Holstein Sup., S. and J. McCormick, Hilltara Lauthority Echo 2; res., McLean family, Priestland 5446 Shot J Rose.